Get set to bring incedible 3D augmented reality dragons to life before your eyes! Using your tablet or smartphone, meet amazingly detailed dragons and fly them around your bedroom - fly a life-size Hiccup and Toothless, try your hand at training Stormfly, make Meatlug fly forwards, backwards and hover, take control of fiery Hookfang, and meet Barf & Belch. Take photos of the moment and share them with your friends and family! 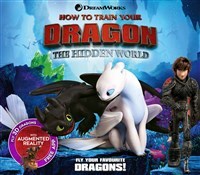 Bring Hiccup, Toothless and the gang off the pages of the book and into your world with Augmented Reality! Emily Stead is an accomplished author who has written hundreds of children's titles, from best-selling character annuals through to story and activity books, including several colouring and activity books for top UK football clubs.